Well...it is officially that time of year again! The Christmas Tree lots are now set up! No trees...just the fencing, lighting and signage. Trees soon to come! Amazing how fast this all happens! We decided about 3 years ago to go with a fake tree...see I could use the word faux here...but we go with a pre-lit WHITE tree..so you do not get more FAKE than that! We love it! It is just over the top glitter and sweets, vintage tinsel and ornaments galore! When we finally own our own home, we will most likely have a real tree each year! I would hope to get a tree with the root ball still attached, that way we could plant them year after year! We did that when I was little. It is so fun to look back and see the row of trees, remembering each holiday. We are on the look out for a new fake white tree....since our top section of lights burned out 2 days after Christmas last year! We have been having no luck. I am not really a fan of the iridescent look, nor the wispy hairy look, which is what Martha decided to go with this year. I hope I do not have to cave and go with hers. It seems everyone is offering the same thing. Fingers are crossed. I have a little while longer! I am still receiving some of my birthday purchases. I hope to take pics of them all to show you! 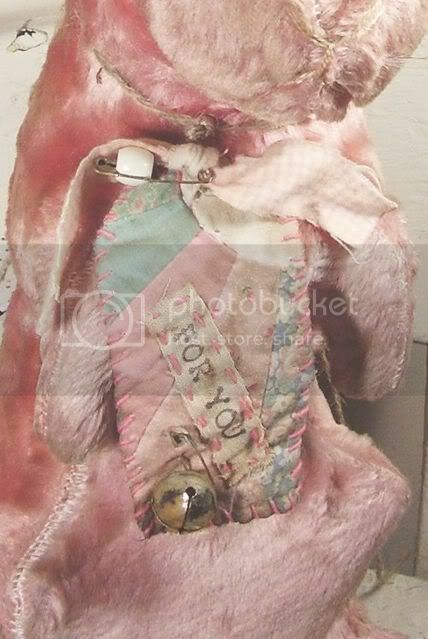 For today I have a photo of the newest member of my vintage bunny rabbit family! He is from the 1940s, and stuffed with sawdust. Quite well loved I must say! That is what I love about him. His once bright pink fur is now a broken-in dusty mauve. His ears are the color of sepia book pages. The super sweet and oh so vintage looking tag around his neck is another purchase, that looks as if it has been a part of his life forever! I was so so delighted when I opened a package of four of these primitive style candy colored patchwork tags today! I found the sweetest gal named Rosemarie selling them on ebay ! I figured they would add a vintagey touch to a new Christmas stocking or look super sweet tied to a brown paper package. You can only imagine how excited I was when I thought of Mr. Bunny here! Perfect combination! Don't you think? Love them together! I think he agrees! 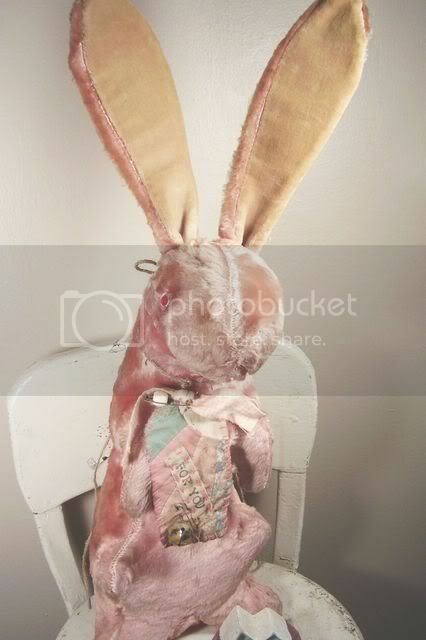 I will be sure to take some pics of my entire vintage bunny family one day soon. They all live in our bedroom, with our family of vintage paper mache bunnies as well! I am addicted! Really! Well...we are swamped with work right now...so I must go to help poor Aaron! He is cutting hundreds of ornaments!! Really! This place is officially Santa's workshop! time to get that new Christmas cd I saw at target! maybe tomorrow! I hope everyone has a great next few days! If traveling, have a safe trip and lots of fun! I will be posting again tomorrow, but for anyone leaving early for the holiday...Happy Thanksgiving!! Thank you so much for visiting me! It means so much!!! Love the bunny! Have you been to old navy lately? THEY have the cutest white trees you have ever seen... but ya can't buy them... that doesn't help does it? But Target has a really cute 6 footer too. I wanted it but Bryan says he's not ready to go with the fake tree thing yet :( So maybe next year!